Through this collection of practical advice and spiritual insights, you will find not only the time to read God's word, but also find the peace and strength to help you through all the difficulties and challenges of modern life. No stranger to demands and business, Joyce Meyer has gone on to write some of the most widely read books on growing closer to God over the past years. Books like Power Words, The Mind Connection, and How to Hear From God have gone on to help millions grow closer to God and change their lives for the better. 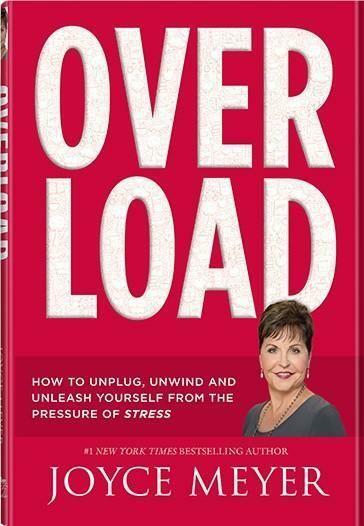 The unstoppable ministry train that is Joyce Meyer continues with another Christian Lifestyle Help book "OverLoad". As you would imagine this book is written to help those people to deal with the overwhelming circumstances of everyday life and applying their faith in those moments. This is very much in line with Joyce's ministry of "Enjoying Everyday Life" which you can find on multiple Christian broadcasters around the world. Joyce is very well known for her books like "Battlefield Of The Mind" and others which look at related topics. 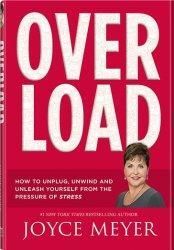 However "OverLoad" is a very practical book looking at the effects of stress and overwhelming life on both the body, the mind and our spiritual life. Joyce has a very distinct voice, no matter how you consume her ministry it always sounds like Joyce Meyer. As you read the book, you could almost hear her saying the words as you read them, you almost read them in her voice in your head! So this is everything you would expect from this woman, including examples from her own life of when she has been overwhelmed, whether the sheer scale of her ministry commitments, or just day to day life with her husband. There is something very real about the way that this comes across. Joyce also makes up hypothetical situations as well to explain how the teaching she illustrates can help you feel better about your life. There is an interesting anecdote about a woman buying a shirt, she gets home and shows her husband and kids and they tell her it is ripped. She is so upset she won't listen to reason and keeps the shirt, but when she wears it she doesn't enjoy it because she knows it is damaged, even though the fault is covered up. This is contrasted with the same woman who takes the shirt back to the shop and gets it exchanged, and has a more enjoyable time because she doesn't feel like she has to hide it. The illustration shows how we can choose to deal with something the wrong way, and from one decision we can add a whole lot more stress to a situation, or we can deal rationally in the first place and then not know anything of that stress. So these are the kinds of illustrations that Joyce uses, as well a examples from the Bible and encouraging Bible verses, Joyce guides us through the minefield of trusting God for our lives in every area. 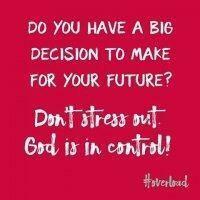 Knowing that when things go wrong that He is in control. If you like Joyce Meyer, and many people do, then this will no doubt be of help and comfort when facing circumstances in life that are out of your control, and better handling those circumstances that you may have more of a say in. I do feel that sometimes her solutions seem a little bit simplistic, but I know, from experience, that trusting God who knows better is a safe path. The book is simple to follow and with many interesting stories will offer help and guidance in a tough time.